During the month of March 2016, 3 new comets were discovered. On March 17, 2016 a new impact flash on Jupiter has been captured by amateur astronomers. 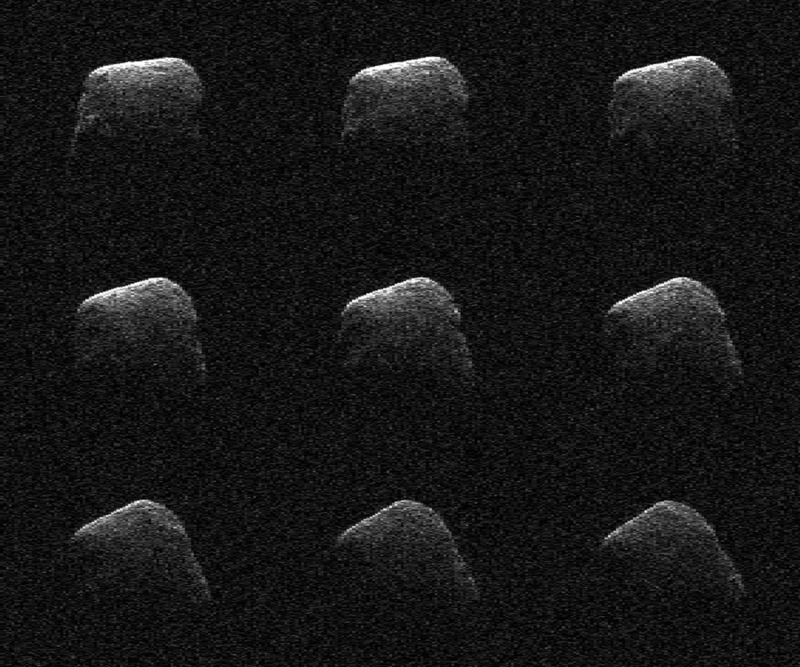 Moreover, delay-doppler images of asteroid 2016 DV1 (on March 03, 2016) and of comet P/2016 BA14 (on March 22, 2016) have been obtained by Goldstone Solar System Radar. (see below for more about these news). "Current comet magnitudes" & "Daily updated asteroid flybys" pages are available at the top of this blog (or just click on the underline text here). Scientists using the Goldstone Solar System Radar in California's Mojave Desert observed comet P/2016 BA14 during its historic flyby. Close approach of March 22, 2016 by P/2016 BA14 has been the third closest on record and the closest flyby of a comet in 246 years (for more info about P/2016 BA14 see our previous post). 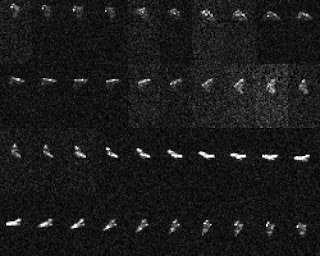 Radar images from the flyby indicate that the comet is about 1 kilometer in diameter. Moreover data collected by V. Reddy using the NASA Infrared Telescope Facility (IRTF) on Mauna Kea, Hawaii indicate that the comet reflects less than 3 percent of the sunlight that falls on its surface. On March 17, 2016 (at 00:18:35UT) a possible impact flash on Jupiter was imaged independently by 2 amateur astronomers: Gerrit Kernbauer (Mödling, Austria) & John McKeon (Dublin, Ireland). Both videos are on Youtube: bit.ly/1RwXOZb & bit.ly/1RwXOZc. If confirmed, this becomes the fifth such event in the past decade. For more info about old impact flashes see our previous post here. Click on the gif below to see a comparison side by side of the 2 videos with an apparent impact flash on the Jupiter's East limb. 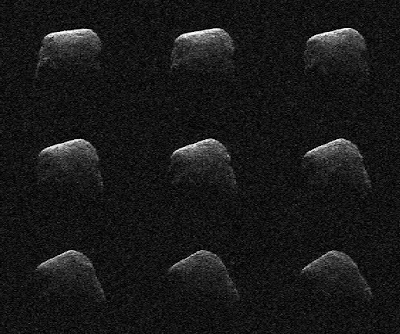 On March 03, 2016, delay-doppler images of asteroid 2016 DV1 were obtained using DSS-13 to transmit and GBT to receive. 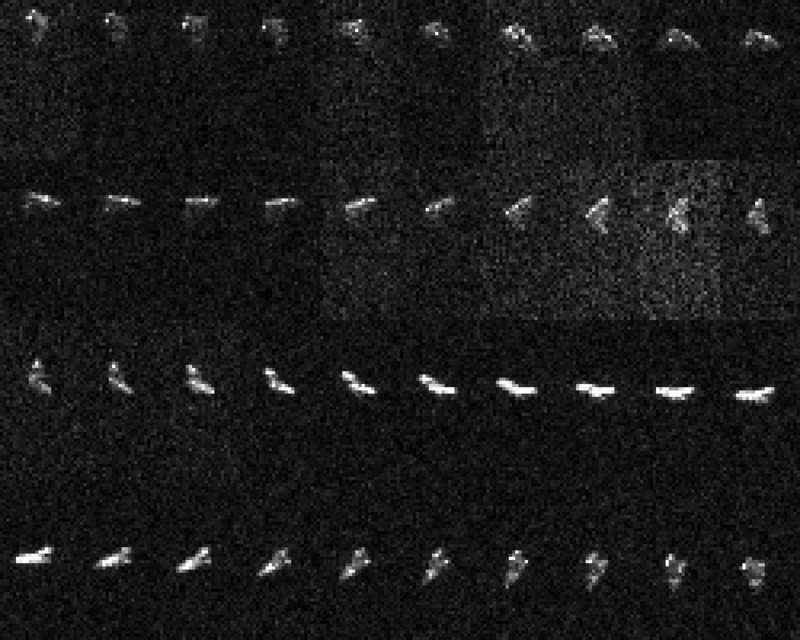 The images span ~1 rotation. Rotation period is about 304 +/-8 seconds.